UMBC women's lacrosse head coach Amy Slade has announced that defender Jenna Baverman and midfielder Catherine Sims have been selected as captains for the 2019 season. The two captains will be leading a team with seven new faces for the 2019 campaign including Megan Cleverly (Middletown, Md./Middletown), Adriana D'Amore (Mt. Airy, Md./Linganore), Rachel Ridgley (Owings Mills, Md./Franklin), Lexi Roberts (Baldwin, Md./Fallston/Army West Point), Olivia Schwiegerath (Frederick, Md./Oakdale), Sophia Shucosky (Lutherville, Md./Maryvale Preparatory), and Kelsey Weishaar (Sykesville, Md./Century). Coach Slade, now in her seventh year, is looking forward to the 2019 season so that the team can add to the list of growing accomplishments that the athletic department has been seeing in the recent years. 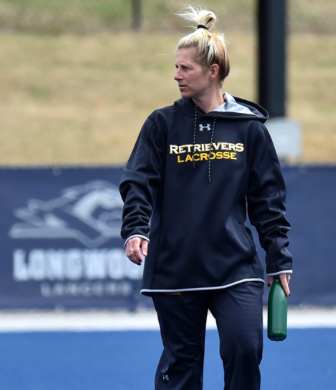 "I'm really excited about the progress that UMBC athletics is making, and even bigger, the progress that UMBC women's lacrosse in contributing to that overall success," Slade said. "We really want to measure our overall wins in the type of person we put out there, but also the type of player we put out there, so just a well-rounded student-athlete. I think we're heading in the right direction." You can support UMBC women's lacrosse and our student-athletes by making a contribution today. Every gift and every amount counts. Your gift of $50, $100, $500 or $1,000 will directly and immediately make an impact in recruiting, scholarship resources, training and nutrition, facility enhancements and academic support. Your generosity will enable our team to achieve its goal of excelling in the classroom, on the field, and in the community. Thank you, in advance, for your support!